Demographic distribution of people with French Ancestry across Sydney’s Eastern Suburbs. Source: Australian Bureau of Statistics 2017, Cultural and Language Diversity (2011 Census), TableBuilder. Findings based on use of ABS TableBuilder data. French Australians (Franco-Australiens in French) are Australians or Permanent Residents that also have the French nationality or French ancestry. The French community in Australia has been slowly growing over the years, with roughly 1/3 of all French Australians living in NSW. Although very isolated, Australia remains a dream-like destination for many people around the world, and French people are no exception. In fact, according to data collected during the 2011 Census (ABS, 2011), there were over 110,000 French Australians in 2011 spread out across Australia. According to the 2006 Census (ABS, 2006) there were 98,300+ French Australians in Australia in 2006. Today with 110,300+ French Australians (0.51% of the total Australian population), Australia’s French community is bigger than ever (ABS, 2011). NSW accounts for 1/3 of French Australians in Australia (with just over 35,600 people in 2011). Most of them are regrouped around Sydney and in the Eastern-Suburbs (where the International French School is located), while Melbourne and Brisbane share most of the remaining French Australian population. 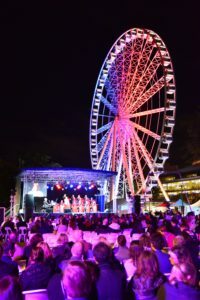 Launched in 2010 as the Brisbane French Festival, Le Festival (as it is now called) has become the largest French Festival in Australia. Le Festival’s goal is to promote and share the passion for French culture with all Australians. Their mission is to showcase a diverse range of music, food, education and lifestyle “à la française”. Betty Moinet, director of Le Festival, promises the 2017 Festival will be the biggest one to date. From Friday 7th to Sunday 9th July 2017, Brisbanites will be able to enjoy a French Market, a French Wine Pavilion, Masterclasses in wine tasting and much more. “We are taking over Brisbane with La French Week (July 10-16), with performances, demonstrations, exhibitions and classes offering a range of ways to engage with French culture,” Ms Moinet said. This year, le Festival will see the return of festival favourites as well as a host of new French-inspired acts. There’s something in this year’s line-up for everyone. Whether you’re looking for French classical music, comic relief, cultural immersion, or just to have an enjoyable time, Le Festival has got you covered. With already over 40,000 registered visitors, be sure to buy your tickets online before June 30th for early bird discounts to what promises to be another great edition of Le Festival. If you can’t make it to Brisbane but still want to indulge in a little bit of French cuisine, Sydney is hosting its own French culture festival. 2017’s iteration of the Bastille Festival will be the best time to experience the best of French culture in Sydney CBD. Following the success of the 2016 edition, Sydneysiders will once again have the opportunity to indulge in delicious French food, cooking masterclasses, live concerts inspired by French culture. Make sure to stop by the BBR Village for a celebration of all things French!